Title, Range, Level, Date of publication, Publisher, Code, Additional instruments. Information about each title is included for use by a compère or use in printed concert notes. All titles can be ordered direct from the publishers indicated or from your usual music supplier, or from Jeffers (www.handbellworld.com) in the USA, or Whitechapel Handbell Music Shop in the UK. 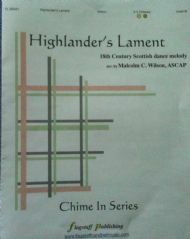 Highlander's Lament, 2-3 octaves, level 3, 2010, Flagstaff Publishing, FLSB431. This melody appeared in the 'Scots Musical Museum' - a major eighteenth- and nineteenth-century collection of Scottish songs of which Robert Burns (1759-1796), Scotland's national poet, was contributor and editor. Burns commented, in his notes for the 'Museum', that the oldest title to this melody he had encountered was 'The Highland Watch's farewell to Ireland'. He goes on to say that 'the chorus I picked up from an old woman in Dunblane; the rest of the song is mine'.The tune is generally considered to have orginally been a composition for the bagpipes. It was published in 1762 in Edinburgh by Neil Stewart in his "Collection of the Newest and Best Reels or Country Dances. "The song, which Scottish folk duo The Corries recorded as "My Harry was a gallant blade", tells the tale of the love of "Highland Harry"(who was a Harry Lunsdale) by Jeanie Gordon, a daughter of the Laird of Knockhaspie in Aberdeenshire. Thomson, the publisher of the poems of Robert Burns, corresponded with Beethoven (1770-1827) over commissioning the composer to make an arrangement of this melody with the text by Robert Burns. After asking Thomson to describe what thesong was about Beethoven created different settings. Have you performed this music? Do please write and let me know by clicking here. Ho Ri, Ho Ro (alternative titles: Tiree Love Song, or Heaven on Earth), 2-3 octaves, level 1, 2007, From The Top Publishing, 20171. This traditional Gaelic melody is from the Isle of Tiree, the most westerly island of Scotland's Inner Hebrides, situated twenty-two miles west of the mainland of Scotland and the twentieth largest island in the British Isles. It is at the same latitude as southern Alaska yet with the moderating influence of the Gulf Stream has a mild climate with some of the highest levels of sunshine recorded anywhere in the British Isles. The song is often credited to Alexander MacLean Sinclair, who collected and published many collections of Gaelic cultural material in the 19th century. He was the grandson of John MacLean of Tiree, known generally as the Bard MacLean, the last professional Gaelic poet in Scotland. The melody has been set to the modern hymn text by John Bell and Graham Maule, The God of Heaven is Present on Earth, published by the Iona Community. 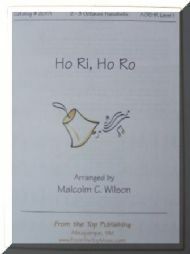 The words Ho-Ri Ho-Ro (pronounced hoe-ree hoe-row) are vocables, or words that don't necessarily have any meaning but are often used in Highland Scots music. 1. Ho-ri, ho-ro my bonnie wee girl. Ho-ri, ho-ro my fair one. Will you come away my love. To be my own my rare one. 2. Smiling the land, shining the sea. Sweet is the smell o' the heather. Would we were younger you and me. Ho-ri, ho-ro my bonnie wee girl. 3. All the day long, out on the peat. Then on the shore in the gloaming. Stepping it lightly with dancing feet. 4. Laughter above, singing below. Tripping it lithsome and airy. Could we be asking of life for more. My own my darling Mary. Click here to view a preview of the score. Click play below to watch and listen to a performance of Ho Ri, Ho Ro by Dunblane Cathedral Handbell Ringers. An arrangement of Dvorak's famous melody. Original composition commissioned for The Atlanta Concert Ringers of St Mark United Methodist Church, Atlanta, Georgia, USA, premiered 2002. Click play below to listen to a recording of Jessie the Flower o' Dunblane. Fantasy incorporating the melodies "In Dulci Jubilo", "Sussex Carol", "I saw three ships". Click play below to listen to a recording of Jubilate Noël. Massed ringing selection 1997 HRGB National Residential Ringing Week, Dunblane and conducted by the Lysbeth of the title: Lysbeth C Wilson.